With persistent rumors of some sort of tablet-based Mac, it is interesting to see what other device manufacturers are working on in their labs. 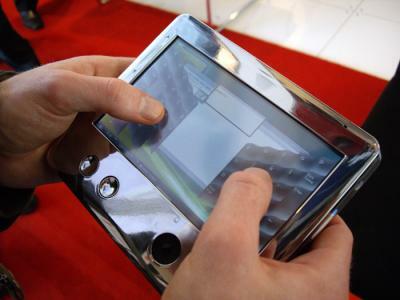 Toshiba revealed last week a prototype device which relies on an on-screen keyboard. The device resembles the Ultramobile PCs that never saw mainstream adoption. This prototype, however, uses Intel's new Atom processor, a 64GB Solid state drive and GPS. Toshiba admits that this version of the device is not commercially viable since it is "too small" but they are continuing to explore the technology. Atom is Intel's new low-power processor line that was formerly known as Silverthorne. Intel hopes these processors will power a new line of mobile internet devices (MIDs). The Atom processor shares the instruction set as the Core 2 Duo so Mac OS X could theoretically run on these new processors unaltered. Intel is expected to be releasing a 1.6GHz dual-core version of its Atom processor on September 21st. Apple has been rumored to be adopting Intel's Atom processor for "multiple products" in 2008.